"An adoptive parent" can be an individual, group of people, family, school, organization or company, and is sending through our organization a financial sum for the education of one particular child. This amount covers tuition, all teaching aids and mandatory school uniform. The shortest period for which the child can be sponsored is 12 months. Providing financial support will open to the selected child education, and thus gives him hope for the future in living conditions that are ordinary elsewhere in the world. "Adoptive family" is during the duration of the adoption periodically informed 3x per year how the child is doing at school. Always approximately 2 months after the end of the school year (in January, June and October) you will receive a certificate, a letter and a photograph of the child. You can exchange letters and pictures with the child or send him/her small gifts and within your possibilities also visit him/her. Adoption of African children – Project of long distance help is much more than only economic aid, because it creates a bond of solidarity, understanding and mutual affection between different cultures. The educational system in Kenya is basically similar to ours – children may start the maternity school at the age of three, the first class at the age of six and finish by eight class. In the end of eight classes they take exams and can enter high school - something similar to our grammar of apprentice schools, mostly of boarding type and for four years. After final exams, which are similar to our graduations, students may apply for college, i.e. technical institutes with a specific orientation (administration, IT, health care, teaching, etc.) or for universities. You can find in our programs children from 3 years old up to high school students, possibly even college of university students. School year in Kenya begins in January and is divided into three periods (2 x 3,5 or 3 months), among which are holidays. The „adopted“child may enter school only at the beginning of each educational period – in January, May or September. After the end of each period the school issues a „certificate“, which the „adoptive parent” will be sent together with a letter and photo from the child. Also children in pre-school age need your support because a maternity school is really essential preparation for a primary school in Kenya. It is mainly because English is teaching in primary schools and it is not enough for children to know only their tribal language. Some maternity schools can give a certificate to children. 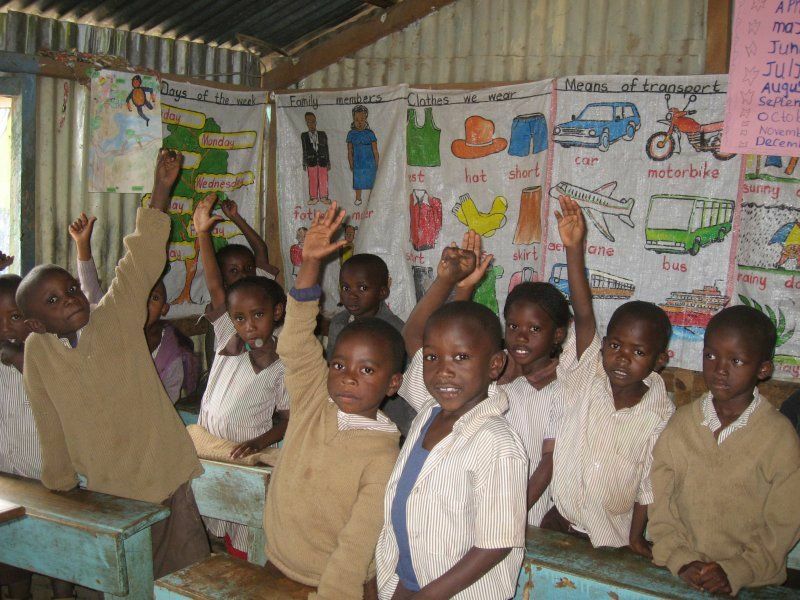 Since January 2003, when Kenyan government has been changed, primary education is for free. Children visiting public school don’t have to pay for school fees; however, they still have to pay for school uniforms and text books and for exams which is unaffordable for many families. We decided that in case of children who attend public schools and therefore do not have to pay school-fees to continue with sending the same amount of money to Kenya and use it for buying other needful things for these children as (apart from text books, learning materials and school uniforms) sportive clothes and shoes, dictionaries, mattresses, blankets, mosquito nets, X-mass wear, etc. We are simply doing our best to use the money you send the best way possible. Public schools are overcrowded and have small budgets - therefore, they are often of poor quality. That is why we support children also at private schools, which are of higher quality and before the change of government were the only ones that allowed lower-classed children to get education (these schools were attended also by gratuitous orphans and poor families paid for school-fees according to their conditions). At the end of last year of primary school, i.e. in 8th grade, children pass “National Comparative Tests of Basic Education “(Kenyan Certificate of Primary Education). Tests are united for all schools in Kenya and their results are processed and evaluated by the state. This process is quite lengthy, because there is large number of schools in remote areas, not all tests can be handled electronically, etc. That’ s why kids will get the evaluation at the turn of January and February of the following year. Based on the results obtained they may then apply for admission to a particular high school. Most elementary schools do not issue at the end of 8th grade a certificate, a little later; "adoptive parent" will receive "Result Slip", i.e. the results of national examinations. In high school, children are accepted on the basis of the results of „National Comparative Tests of Basic Education“. Usually, of course, there is a rule: the better the results, the better (and usually cheaper) high school. The child asks to be admitted to the best school, which fulfills the conditions for admission, and waiting to see if s/he will be accepted. In case of negative response, they can apply for another school, etc. First trimester of first grade of high school does not begin in January, but in February or March, and the children have an opportunity to start school even a bit later. Information on whether the child continues to study in high school (and specifically which one), are though given to "adoptive parents" within the end of February. If the child is not accepted to any high school or didn’t pass the final exam, s/he usually repeats the 8th class. S/he has the opportunity to deepen their knowledge and at the end of next year to achieve better results in exams. But such cases are rare. Secondary schools in Kenya are generally oriented (similar to our school system). Studies take four years and culminating by a "National Comparative Tests of Secondary Education" (Kenyan Certificate of Secondary Education), which takes place in November, when the school year ends in Kenya. Just like the final exam in elementary schools, even these tests are uniformed for students across the country. Even in this case, the results are processed and evaluated by the state and the process is very lengthy, so children will receive first evaluation within March next year. Costs associated with education at the secondary school in Kenya are roughly twice as high as costs in elementary schools - 14,400 CZK (600 EUR) per year. It is good when the "adoptive parent" would pay the full amount to cover tuition even in a boarding school (i.e. Including accommodation and food) and all the necessary school supplies, but we understand that it is already relatively high amount and the financial situation doesn’t’ allow to everyone to pay so much money. That is why we allow to "adoptive parents" to pay the original amount of 7200 CZK (300 EUR) per year. Most Kenyan families really welcome your, at least partial help, as they have already received your support and you helped them to bring their child so far so they are trying to get the the rest of money themselves. Most children that get in their studies so far that they are able to finish high school, is keen to study further. Kenyan secondary schools provide general education, and so it is important to choose some specialization, which provides in the future better chances to find qualified job. Based on the results of final examinations of secondary school children receive invitation letters from a particular school, or have themselves reported on schools that accept the results they have achieved during testing. Most children are accepted to "college", i.e. schools similar to our higher specialized schools or "special domain” schools which continue after high school education. Studies are usually for three years. The best children can go to university, where the length of study is from 3 to 5 years. Some children prefer shorter, several months or a year practical courses, where e.g. they can improve their work with a computer, how to be a hairdresser, a driver, become experts in hospitality, etc. Students often start their first year of "college" within May or even in September. In this case, "adoptive parent" pay tuition fees in regular payments, and the child then gets the full amount when entering the first trimester. The contribution for a Kenyan child is 7200 CZK (300 EUR) for the whole year - it can be paid in total, in three payments or monthly (the first payment before school entrance is 2400 CZK (EUR 100) and then monthly 600 CZK (EUR 25). The "Adoptive parent" can also choose way of payment most suitable for him – by bank transfer to Centrum Narovinu account (we have a CZK and EUR account in Komercni banka and EUR account in Slovak ČSOB), by post office (again to Centrum Narovinu account), or by cash in our Prague office. Account number can be found on our web pages, in the contract about adoption or on-line on "Personal adoptive parent page" in the "Detail of Adoption". The child's number from the database of Adoption of African children is always necessary to be used as variable symbol. If you choose monthly payments, you need to communicate with the coordinator for a particular process. Your adoption should start by payment the entire amount for one school period, i.e. 2400 CZK (EUR 100). The following monthly payment of CZK 600 (EUR 25) must be set as there is whole amount for next trimester, i.e. CZK 2400 (EUR 100) by the deadline (15.11., 15.3., 15.7.) If the amount is not complete, supported child gets into a difficult situation. Please, try to pay regularly according to chosen way, and inform your coordinator in CR about possible change. You will save us difficult searching for payments and unpleasant reminding of underpayments. How we send money to Kenya? Money is collected on Czech (or Slovak) account of our organization and then for all "adopted children" is transferred together to an account of our partner organization in Kenya. Transfer money for each child separately is not possible, mainly because of high fees that banks charge for international transfers. The cost of the transfer would be in this case greater than the sent amount. Families of enrolled children in the program of "adoptions" are very poor; they do not have their own mailing address, and certainly no bank account. Moreover, in cases where the parents or guardians of children would be receiving money for colleges in hand, we would not be able to ensure that the purpose is really applied. Probably there would be always something "more important" for payment - the funeral of a relative, better food, rent, medicines for a family member, alcohol for some fathers, etc., and the child would eventually did not get his chance. How the annual contribution for the child is used? • 75% of the amount (CZK 5,400) is received by the child in Kenya. From this amount is paid school uniform, textbooks, school supplies and school fees. In some areas where there are good public schools, where is no need to pay school fees we use the funds to purchase sports clothing and footwear, dictionaries, mattresses and blankets, mosquito nets, Christmas food, etc.). • Max. 25% of the amount (CZK 1800) is applied to the organization of the project Adoption of African children. It is necessary to pay postage (sending packages with products from children in Kenya to the Czech Republic, sending out letters to "adoptive parents"), bank fees, rent and operation of the office: office supplies, telephone charges, internet, staff salaries in the Czech Republic and Kenya, external accounting company, travel expenses of volunteer coordinators in Kenya and in the Czech Republic, printing photos of children, website, promotional materials, etc. Part of the money also goes to support other projects of Centrum Narovinu, especially on the Island of Hope (Ostrov Naděje). A donor who adopts a child in the program Adoption of African children is regularly informed about current and upcoming new projects and events of Centrum Narovinu. A detailed schedule of money management can be found in annual reports, which are available on our website. * The distribution of money is different if a child is encouraged by higher (double) amount. In this case, "adopted" child will receive 87% of the contribution and max. 13% is used to the organization of the project of the Adoption and for needs and projects of the Centrum Narovinu. Amounts sent to the Adoption and support of other projects can be deducted from taxes. You can ask to issue the gift certificate by e-mail or on the "Personal adoptive parent page." Confirmation will be issued after financial closure for the year (i.e. from mid-January) and will be sent by e-mail. Because we found out that majority of „adoptive parents“considers the Adoption as a commitment for more than one year, the contract is signed indefinitely. In case of any change (address, telephone, e-mail), please, inform your coordinator as soon as possible or take the opportunity to edit these data on your „Personal adoptive parent page“. You will avoid misunderstandings in getting invitations and information about the project and actual news from “your” child. The contract is made on indefinite, which naturally does not mean that the "adoptive parent" must continue supporting chosen child up to his / her graduation. We understand that some unexpected events might happen and the sponsor will have to terminate the adoption before the pre-arranged time. Or you will find out that our program is not suitable for you. We definitely do not want that supporting the child via our program changes into somehow enforced sponsorship and obligation. It is not possible to demand donation. If the "adoptive parent" decides to withdraw from the contract, we always try to find for the child in the shortest time possible another so that the child could continue in already started school attendance and continue uninterrupted and complete education. Therefore, it is important for us on such a decision to be informed at least four months before the date of the next payment of tuition fees. Thank you for your understanding. If you fail to pay for the next school year, and we repeatedly fail in getting touch with you, the contract will be terminated by us and we will begin to search for a “parent" for the child. Once we receive your signed contract and the first payment will be made, you will be able to access "Personal adoptive parent page", where you can e.g. print out a certificate of adoption, ask for gift certificate, see an overview of your payments and obligations or create a new contract. As a login you can use your e-mail address listed in the contract. Password can be chosen by you, or it will be generated automatically. Link to this page and more information will be sent to you together with confirmation of delivery of the donation agreement. We ask you for patience in communication with our coordinators - they are unpaid volunteers, who are engaged in the Adoption project in their free time. Therefore it is not within their power or possibilities to answer all your questions immediately, or to be on the phone all day long. According to internal rules of the project you shall be answered within three days. We are fully at your disposal in the office on Monday and Thursday between 9:00a.m. and 5.00p.m., on other days after phone arrangement. It’s possible to write to the child during the whole year. Families involved in our program live in poor areas - houses in the countryside or in slums, and not have their own address, so all the letters and packages are sent to P.O. Box of our Kenyan office, where it is picked up by the competent coordinator at the earliest opportunity and gives it to the child. Do not send letters and packages to the address of the school, they will not be given to him at school! You will get more detailed instructions on how to submit your mail to Kenya, by mail along with the confirmed contract, or you can receive it by e-mail from your coordinator. We recommend you to write short letters in easy English. Their contents should be understood by the child who lives in reality quite different from ours. It is also good to remember that the role "of parents at a distance" can be somehow confusing for the child, so it is advisable to refer to them as "a little friend". Children very welcome, if they get a picture of their "adoptive parents". We also recommend you not to mention your address in the letters to avoid the situations that persons close to the child use it for their requests (which has already happened). Don’t forget to mark the envelope with the name and identification number of the child and the name of the Kenyan coordinator. You will get information, pictures, school reports and photos from the child - but we cannot guarantee handwritten letters from the child since many children cannot write so well to keep written contact. In such cases an adult: teacher, parents or our coordinator will write the letter on behalf of the child, and the child might only draw a picture, for example. It will be mentioned who wrote the letter for the child. Smaller presents are possible to send directly by mail, but it is very limited because of duty in Kenya, and also packages often get lost. We have been trying to arrange exception from paying duty for several years, but so far unsuccessfully. You will be sent more information about what is appropriate to send to Kenya and how. Do not send big packages or expensive gifts. Because of the great poverty in areas where our project is organized, and malfunctioning of local post offices packages are often lost. Another problem is above mentioned duty, which is high for such packets. If you wish to meet your adoptive child personally, it is possible to visit him / her directly in his / her country. In such a case we ask you to solve this personally with the project coordinator – s/he will explain you all the process and refer you to a competent person. On the other hand, transporting the child to the Czech Republic is not possible. To "withdraw" the child from the reality s/he lives in, to enable him / her to learn our (so different) reality and to send him / her back would be very traumatic for the child and definitely would not contribute to anything good. Apart from this fact, bureaucratic issues connected with such invitation, visa and other necessary documents are very complicated and in many cases unrealistic. We also try to organize meetings of „adoptive parents“ - discussions connected with video and photo projections, where you can personally speak to Adoption coordinators, and learn not only answers to your questions, but also gain information about news in the Adoption project and about other activities and plans of Centrum Narovinu. "Adoptive parents" are notified of mentioned meetings in advance via e-mail. Our projects are organized by a network of volunteers. Join us! You can arrange e.g. a collection, an exhibition or a lecture at your home, at work or at school, help us with translations into English, printing materials and cutting videos, or basing of letters in our Prague office. Very important is the promotion of the project – distribution of leaflets for adoption in your area (suitable are tea rooms, cafes, libraries, schools, leisure centers, waiting rooms, etc. ), or if you offer adoption to your friends and relatives will be really helpful! For more information on how to actively participate in the project, please contact our office. If the current situation does not allow you to adopt at high distance any children, but you would like to financially support it, you can do so through the Club of Friends of Adoption of African children. This fund, formed by single contributions, supports children who have lost their adoptive parents, and allows them to finish their studies - finish elementary school or continue their education at secondary school. Current information and names of children who have been given assistance can be found on our website. Children are selected by Kenyan coordinators who move in the local community and are familiar with the situation of individual families. Those most needed, i.e. orphans and children living in the poorest families who cannot afford school fees, are selected to the program by team of people who, after careful consideration of the situation, decides whether the child meets the established conditions.